Problem: Our team focused on designing a product that would help people who wish to adopt a pet. We found that there were some common concerns for potential pet adopters while trying to adopt a pet as well as concerns for animal shelter/rescue group volunteers during the pet adoption process. We wanted to help our furry friends find a new home that they deserve! 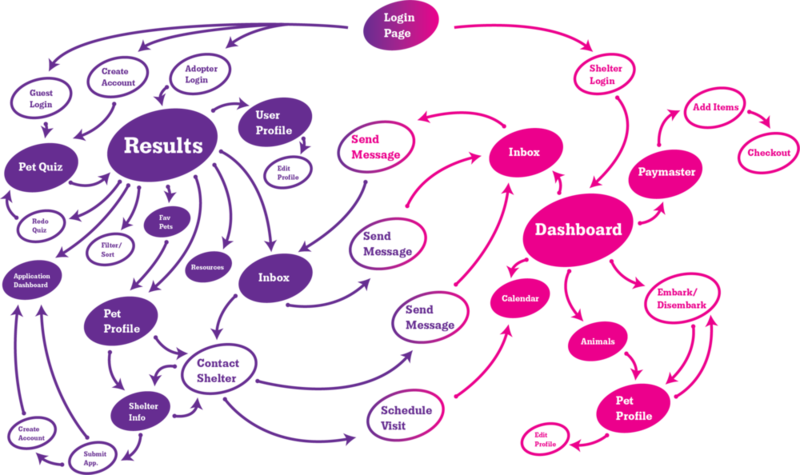 Solution: Thus, we designed a web platform solution with two portals: a pet adopter side and a shelter volunteer side. Both sides would use the same server and communicate in real-time with each other, thus provide a cohesive experience for both sides of the pet adoption process. Purpose: We conducted several semi-structured interviews to get better insights on the pet adoption experiences of those who have previously adopted pets. One of my teammates and I also went to the Atlanta Humane Society and interviewed the Director of Operations to get a potential stakeholders’ perspective on the pet adoption process. After we analyzed our findings, we were able to generate a list of categories of people who typically adopt: families with children, lonely people, people with lonely pets, hopeless romantic, volunteer, and first-time owners. We also saw that some people within this user group logically adopt, meaning that they think clearly about what pet would best serve their needs. People within this group would then tend to adopt older pets or other non-popular pets. Some people also are illogical when they adopt, meaning that they tend to adopt pets based on certain factors such as looks and don’t fully think about their limitations when adopting. We also saw that some people in this group either search for a specific kind of pet or not. Based on these categorizations, we generated some user personas to get a better understanding of the types of people that fall into our user group. I made the graphics for our user personas. Design idea: a quiz that would match certain pets to a human based on factors like living condition, breed preference, etc. Design idea: a mobile AR app that would allow users to interact with a virtual pet with a customizable personality, breed, and size. This would let users see what a certain pet would look like in their own home. Design idea: Would be used as a promotional material for animal shelters that would grasp the user’s attention when passing by the shelter’s stand outside of a pet store. The user would become fully immersed in an environment where they would see a pre-recorded video of a certain pet at the event’s interactions with an animal volunteer. Design idea: A panel of TV’s that would show various videos of cats and dogs provided by an animal shelter. If intrigued, the user can interact with a certain animal to find more information about it. This would be used as promotional material for the animal shelter. A pet matching quiz on the web that allows users to be matched to certain pets based on that users’ lifestyle, preference on breed, size, and other factors. An augmented reality and location-based mobile application that prepares users to own a pet by providing customized information about their potential pet, their required pet care, and the pet adoption process. An augmented reality mobile application that guides users to explore possible pet accessories or items (ex litter box, bed, etc) through virtual placements within their own home. In order to narrow down on one design solution, we went around a section of Georgia Tech’s campus, Tech Square, and asked anyone that we found who has adopted a dog or cat (or planning to adopt a dog or cat) to evaluate the wireframes of all three design ideas. We spent roughly fifteen minutes in each interview session and received feedback from a total of seven participants. We arranged the to-be-gathered feedback into four categories: successes, concerns, recommendations, and overall score. Overall score was an average of all the participants’ likelihood to use each design solution. We asked each participant: on a scale from 1 to 5, 1 being least likely, 5 being most likely, how likely would you use this application? We calculated the overall score based on each participant’s response to this question. Based on our findings, it seemed that the Pet Matcher received the most and the highest praise. Thus, we decided to expand on this design idea for our final solution that aims to improve the pet adoption process. 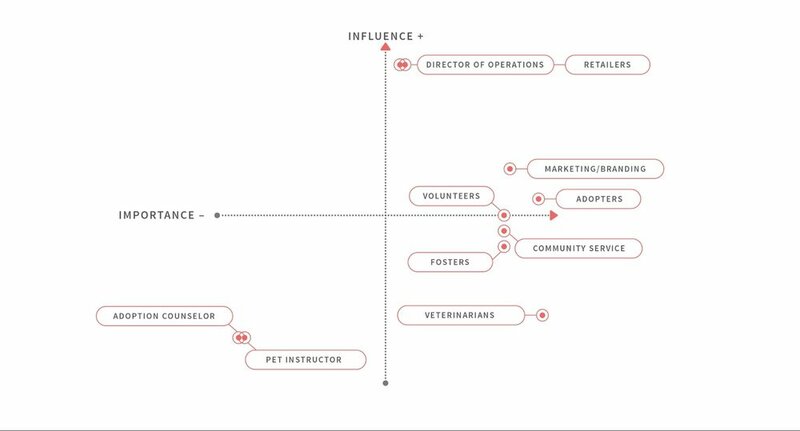 After looking back and conducting more research, we realized that the pet adoption process is two-fold, and we decided that our design would have to serve two sides of the process: adopters and shelters. In our current iteration, once an adopter has discovered a potential pet, they can take more seamless action to connect with the shelter caring for them. The shelter should be supported with information on an adopter’s lifestyle and capability to care for a pet, enabling the shelter to better consult an adopter when initially approached. Since I had the most experience and understanding on how this system could be designed, I took the lead in creating the user flow, information architecture, and a UML class diagram. The UML class diagram was created to provide an extra layer on how this system could be implemented in the future. Since this solution had two portals that needed to be designed, our team split into groups of two where each sub-team worked on either the adopter-facing side or the shelter-facing side. My teammate Rex and I took the responsibility of designing the adopter portal. We each took turns coming up with potential design ideas for this portal. Here are some screenshots of the first iteration that I came up with. 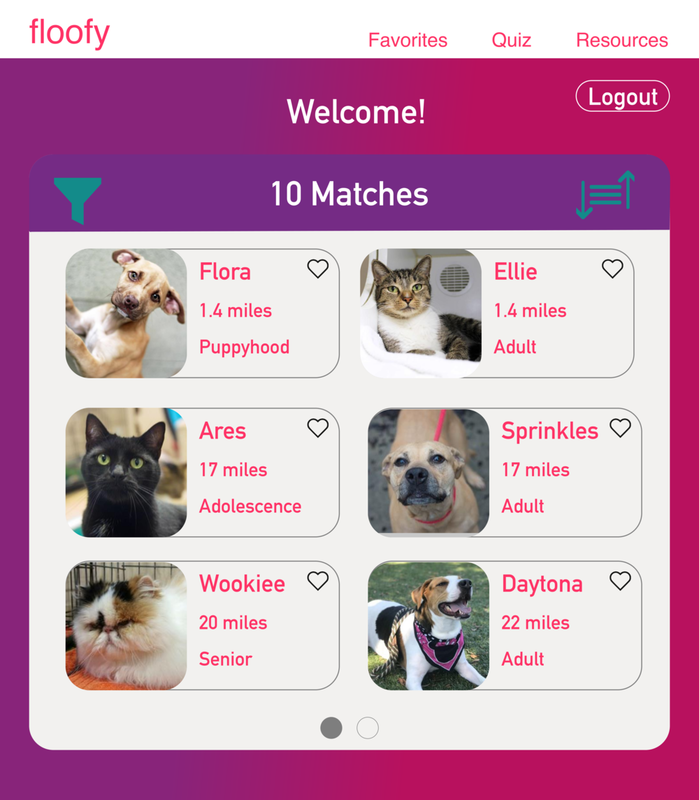 I tried to figure out a design that would also be mobile-friendly so that pet adopters could also match to pets from the convenience of their smart phone. Here, users go through our quiz where they indicate their pet preferences and lifestyle habits. Users can see the pets that they matched with depending on the answers they gave during the Pet Matching Quiz. On the right of the Pet Matches Dashboard, users can see individual an individual pet’s background, physical and health attributes, and contact information for the shelter. Depending on the shelter and their requirements, users can fill out an initial application for a particular pet through this portal that will be then sent to the shelter-facing side of Floofy. Users can come to the resources tab to find more information about an adoption center or about a particular breed. Here is a video of the prototype in action! This is the first view where shelter volunteers can manage their daily tasks, their appointments, and their messages from potential adopters. Shelter volunteers can view messages and applications submitted by potential adopters through the adopter-facing side of Floofy. Shelter volunteers can view and manage the pets that are currently located at the shelter. This list and any changes made to each pet will be updated real-time and show up on the adopter portal of Floofy. Shelter volunteers can edit an individual pet’s background information and physical/health attributes. They can also start the pet checkout process through this view. In order to adequately measure our progress without overwhelming our participants, we divided the testing into two parts: the adopter side and the shelter side. For the adopter side, we searched for classmates who had ever adopted in their life, and for the shelter side, we reached out to the Atlanta Humane Society and met with a few employees on their Midtown campus. Note: In order to evaluate the validity of our quiz questions, we created a Qualtrics survey, and participants had to answer the quiz so that they would match with a certain randomized pet. We asked each participant to ‘think aloud’ as they were going through the prototypes, and at the end of each evaluation session, we asked a series of follow-up questions and asked them to complete a general SUS (System Usability Scale). Users were presented with confusion particularly regarding the navigation elements and tab labeling. Unclear what the resources tab was for specifically. Some were confused by the color scheme and weren’t a fan of the gradients used. Our participants responded in an overall positive manner. Mentioned that this system could be beneficial to their organization and would help to eliminate some of their frustrations. Participants expressed confusion when presented with the task functionality. The initial navigation was difficult to understand. Participants found a lot of the features to be useful, but they were not entirely sold on it - most likely due to some of the features not being fully developed. This project was a very valuable experience for me since I love animals and believe that every furry friend deserves a wonderful home. Thus, it was enjoyable to make a platform that would help improve the pet adoption process. This project also helped me realize that it’s important to understand your users so that you can design a solution that would improve their experience rather than just guessing their wants and needs. This project allowed me to expose myself to various design fundamentals. Try to get more feedback from shelter volunteers as it seems like the shelter portal’s language and navigation was inconsistent to their needs/habits. The overall SUS score for this portal was also not desirable; thus, this side of the system needs the most work. Redesign the adopter portal so that its navigation is clearer to understand and can be used on mobile devices. Construct higher-fidelity prototypes so that users could see all of the features and better understand the flow of each portal.